Dancing Penguins are tapping to the beat with red falling snowflakes around them. 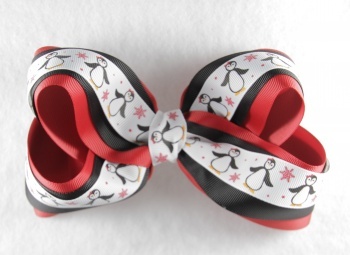 This is a triple layered bow of red, black, and white with penguins. All three layers of this bow are grosgrain ribbon and there is 105" of ribbon. They are all wrapped up into a long bow with no tails to maximize the length of this bow. It goes from 2.25" to 1.5" to 7/8" for the three different layers. Celebrate Christmas with these cute snow dancing penguins.